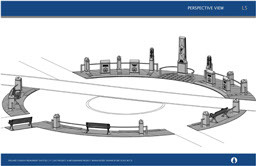 Plans are underway to build The Ireland Canada Monument in Thornton Park, Vancouver. The project is a non- political, non –sectarian, non profit endeavour created to provide recognition to the significant Irish Contribution to Canada. Glin Castle, Co. Limerick had suffered centuries of neglect when Veronica Villiers Fitzgerald, widow of Desmond FitzGerald, the twenty-eighth hereditary Knight of Glin and first cousin of Winston Churchill, married Ray Milner a wealthy Canadian philanthropist and business executive and together they set about restoring Glin Castle. Veronica was also instrumental in establishing Milner Gardens and Woodland on the east coast of Vancouver Island in British Columbia, a wild collector's garden of meadow lawns and rare old Douglas firs and cedar. The Milners presented the gardens as a gift to Malaspina University-College in 1996.